Join us for a feeding seminar on October 11th to learn about your baby's first bites. When to Start, Do's and Don'ts, and direct answers to your questions. For a new mom, there can be many questions about how to transition her baby from breastfeeding or bottles to solid foods. Today there is a wealth of information online, but it's not always easy to navigate that information and determine what will be the best route for you and your child. 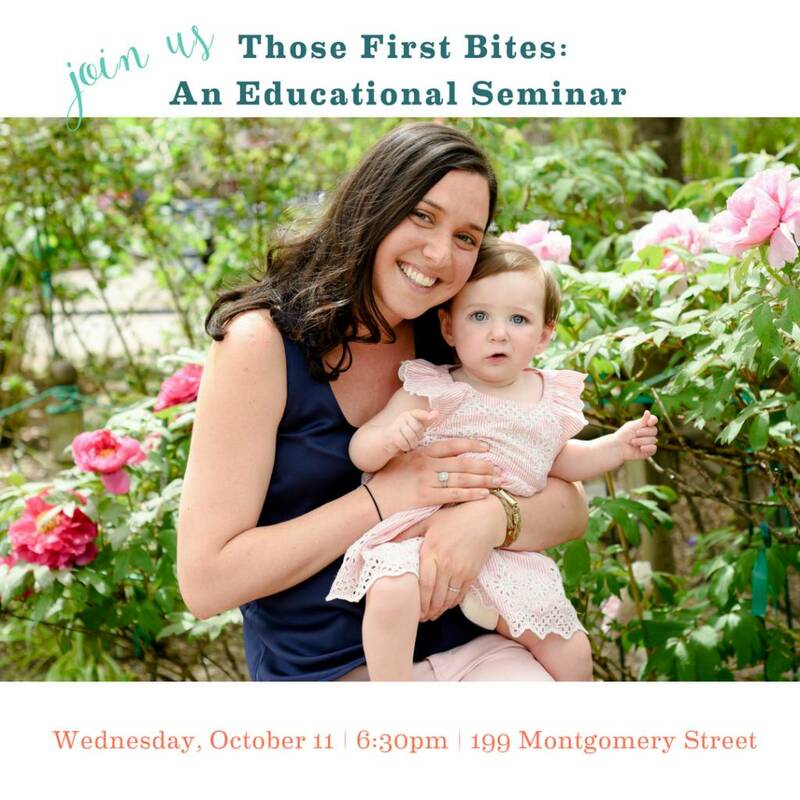 Hazel Baby Store is excited to partner with Alyssa Kane, MS CCC-SLP, CLC, and offer an educational seminar focused around "Those First Bites." I had the opportunity to chat with Alyssa about what moms can expect from the seminar, and simply get to know her as a fellow Jersey City mom. "There are a bunch of letters next to your name," was one of the first things I said to her. "What exactly do they mean?" Alyssa laughed and further explained her expertise. She's a speech language pathologist that specializes in working with babies an young children with feeding/swallowing difficulties. Alyssa received her Bachelors in Communication sciences from Ohio University, and her Masters at Towson in speech pathology. She completed her clinical fellowship at Children's Specialized Hospital. Alyssa's experience is vast and varied - she has her own private practice working with clients that are some form of 'picky' eaters ... whether that's selective eating, transitioning from bottles and purees, or weaning off of g-tube feeding. She has spent time with every type of baby - from the medically fragile, to the everyday child who just doesn't want to chew. She's also a Certified Lactation Counselor, and currently works at NYU Rusk Rehab in the NICU and Pediatric ICU. "Should I be doing baby led weaning or general spoon-feeding?" "What age should I start with solid foods?" "What foods should I start with?" The seminar is October 11th at 6:30pm and costs $20 to attend. Already on to solid foods? In November, Alyssa will be back to talk about the toddler age & creating adventurous eating habits. Attend both classes for a special deal of $30 total.